We received a copy of Kevin Barry’s book, The Ultimate Guide to an Affordable Disney World Vacation, in return for writing this review. Our opinions are our own. As frequent visitors to Walt Disney World, we can tell you first-hand that a Disney World vacation is not cheap. Many people believe a Disney vacation is too expensive for them. Those people would be surprised to learn how much more affordable it can be with some planning and saving. Kevin Barry of FrugalMouse.com has published a new book he calls The Ultimate Guide to an Affordable Disney World Vacation. In this book, Kevin walks you through the methods he has used to save thousands of dollars on Disney World vacations. These are methods that anyone can use to make a trip to Disney World, or any other destination, more affordable. His approach is focused on saving the most money on the big-ticket items of Travel, Hotel, Park Tickets, and Food in advance. This way, you can relax and enjoy your vacation without watching every nickel and dime while you’re there. Kevin walks you through deciding when to go, how to get there, what tickets to purchase, and how to budget for dining. He goes over the pros and cons of transportation, hotel, park ticket options, and dining. Light Weight: At 196 pages, the book is short enough to be read from cover to cover in just a few hours. It’s also broken up into chapters so you can choose a particular aspect of your vacation budget to read about. If the old adage “Time is Money” is true, then that’s a savings right there. Organized: Each section is well-organized and lays out what the reader can expect to learn. Kevin then summarizes the main points at the end to reinforce them. If steps are involved, everything is laid out in a logical order. Tangible: Kevin’s fictional family of four serves as a test family throughout the book. This provides a concrete idea of the savings. You can almost picture the “Barry Family” in your head. Easy to Read: Kevin keeps everything simple and lays it out in a very understandable way. It isn’t full of technical jargon or acronyms. There’s never any confusion as to what Kevin thinks about the planning process. The Title. 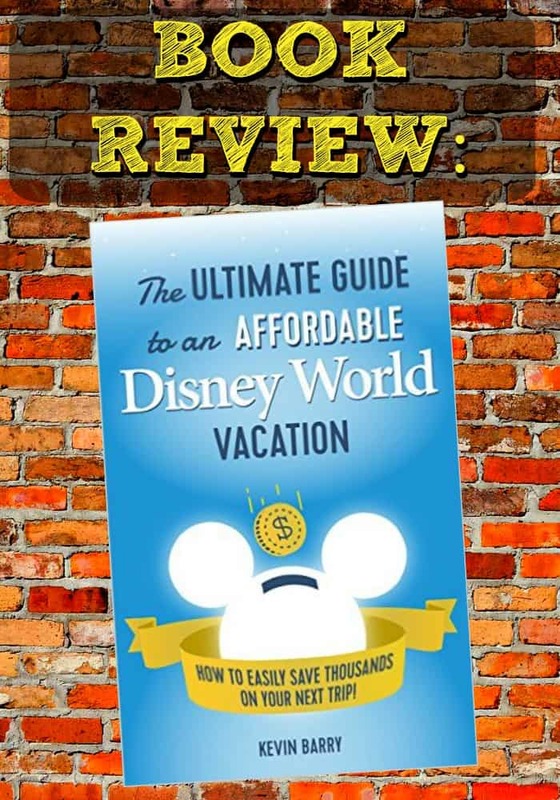 While catchy and inviting, I think the book fails to deliver on being the “ultimate” guide to an affordable Disney World vacation. To be fair, it would have been quite an undertaking to explore every possible aspect of a Walt Disney World vacation. I think Kevin was smart to focus on the bigger ticket items. But I felt that Kevin concentrated on his preferred method at the expense of exploring others thoroughly. The Subtitle. The word “easily” implies that anyone can use these methods to save thousands of dollars. It’s quite clear that the best methods are geared only toward people with a credit score of 700 or higher. In the U.S., the average credit score is 687, which would potentially exclude a lot of people. Errors. I caught a couple of errors in the book. The biggest error which jumped out at me was the pricing of Disney Vacation Club ownership. As a member, I’m well aware of how much it costs. It is not cheap by any means, but the “obscene” figure of $14,000 per year quoted in the book is the result of poor math. I believe it’s just a simple mistake. However, it does make me want to double-check the math in other areas of the book. Savings Fudge? : I’m going to call out Kevin for fudging the savings numbers when it comes to park tickets. He calculates a savings of $294 for his fictional family of 4. But he gets that savings by not purchasing an add-on option. This was the one big-ticket item that doesn’t have any real ways to save. I think it’s a reach to say you saved money on something you opted not to buy. It doesn’t take away from the other tremendous savings he managed to find. Overall, I thought Kevin did a good job of making his case for using credit card rewards programs to offset the cost of some of the big-ticket items that make up a Disney World vacation. I now wish I had these rewards cards. If you’re already knowledgeable about how to make the most of credit card rewards, then you are probably not going to get much more out of this book. Personally, I found the section about using Priceline.com for rental cars very informative. I wished Kevin had written in such detail about using that method for hotels as well. As far as Disney specific information goes, Kevin is knowledgeable about the ins and outs of planning a Walt Disney World vacation. His opinions are pretty much in line with the popular sentiment I’ve seen across the Disney blogs and community forums. The print copy did have pictures, but they were all black and white, which made some of them hard to see. Perhaps the kindle version has color images. If you want to get your feet wet before deciding to purchase this book, I would suggest you check out FrugalMouse.com. You can find some introductory information to using Miles/Points for travel and the latest Disney World discounts. You can purchase The Ultimate Guide to an Affordable Disney World Vacation: How to Easily Save Thousands on Your Next Trip! through Amazon.com. I would suggest the kindle version, which is a better deal at just $2.99 as opposed to the print copy at $12.57. Great thoughts on this book! As I was reading your review, I was sitting here thinking about all the things I could do if I had an extra $14,000 a year to spend! Instead of buying DVC, I’d probably purchase a vacation home in FL! Or, I could buy a new (economy) car each year! Wow! I think I need a new job. In any case, I appreciated your well-balanced review. And your blog looks great!